A permanent breeding resident and a common species during the Minnesota Breeding Bird Atlas (MNBBA). Distributed throughout southern Canada, the eastern United States, and portions of several states located in the northern Rockies and Pacific Northwest. Some of the highest breeding densities can be found in the southeastern United States (Figure 1). Permanent resident and not considered migratory. Some have reported southern movements during the fall, but these are believed to represent dispersal of young birds or seasonal movements following the breeding season (Bull and Jackson 2011). Bark gleaner and excavator that forages primarily on ants and larva of wood-boring beetles. Also consumes nuts and berries. Breeding distribution and relative abundance of the Pileated Woodpecker in North America based on the federal Breeding Bird Survey from 2011 to 2015 (Sauer et al. 2017). Roberts (1932) speculated that the Pileated Woodpecker was a common and widely distributed species throughout Minnesota prior to European settlement. By the late 1800s, however, it had become “so rare as seldom to be seen except in remote places.” Extensive clearing of the eastern deciduous forest, the core of its breeding range, coupled with rampant shooting for both sport and food led to its early decline. However, as the public’s attitude toward wildlife began to change, the woodpecker’s plight began to improve, and numbers slowly rebounded. By the early 1900s, Roberts wrote, “while seeing a Pileated is still a matter of special interest, it is by no means as rare an event as it was a decade or two ago.” It was present even in isolated woodland groves of the western grasslands. Despite its large size and conspicuous behavior, its rarity in the early 1900s was supported by the fact that Roberts recorded confirmed nesting (nests with eggs) in only 2 counties (Hennepin and Stearns) and inferred nesting (nests and young) in Goodhue County and Itasca State Park. Green and Janssen (1975) later reported the species could be found in all forested regions of the state, including “the heavily timbered valleys and lakeshores of the prairie.” It was rare only in the southwestern counties, where habitat was limited. Janssen (1987) further noted that it decreased in abundance as one moved from the deciduous and mixed northern forests of eastern Minnesota west to the prairie-forest transition and grasslands of western Minnesota. He delineated 21 counties where nesting had been confirmed since 1970; by 1998 Hertzel and Janssen added an additional 9 counties to the list. Field biologists with the Minnesota Biological Survey have reported a total of 772 breeding season locations for the species. 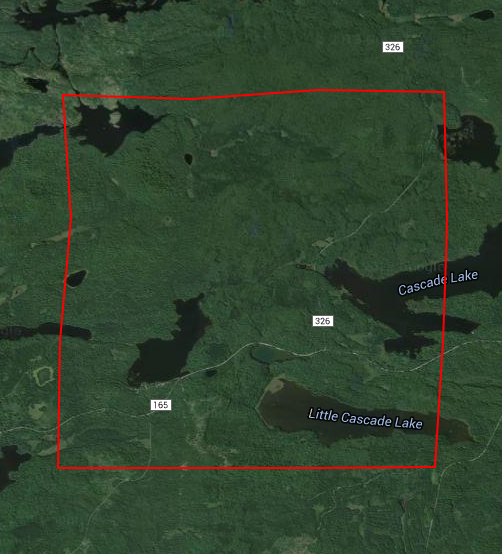 Nine of the locations were from the southwestern corner of the state, suggesting that pockets of mature woodlands were available and provide suitable habitat for the bird (Minnesota Department of Natural Resources 2015). During the MNBBA, observers reported 2,393 Pileated Woodpecker records from 31.3% (1,486/4,751) of the surveyed atlas blocks and from 37.7% (882/2,337) of the priority blocks. Breeding was confirmed in 118 surveyed blocks (Figures 2 and 3; Table 1). The species was reported in 75 of Minnesota’s 87 counties and was confirmed breeding in 37 counties. Fifteen of the counties were additions to the list published by Hertzel and Janssen in 1998. In addition to documenting 7 records in southwestern Minnesota south of the Minnesota River valley, the MNBBA also uncovered numerous records from the northwest in the Red River valley. Every block where the species was observed in the Red River valley contained a wooded riparian corridor. Nevertheless, the species remains most abundant in the Eastern Broadleaf Forest and Laurentian Mixed Forest Provinces, much as it was nearly 100 years ago. The MNBBA predicted distribution map depicts the Pileated Woodpeckers’ wide distribution throughout the state at albeit low population densities (Figure 4). Only the far west-central and southwest regions of the state have small areas where densities are predicted to be near zero. Scattered areas restricted primarily to north-central and northeastern Minnesota are predicted to support slightly higher breeding densities. The population decline that Roberts (1932) chronicled in Minnesota in the late 1800s was witnessed throughout the species’ range, as was its subsequent recovery (Bull and Jackson 2011). Indeed, populations continued to increase throughout the 20th century. Its distribution, however, has remained relatively unchanged, at least within the United States. The second breeding bird atlas conducted in Ontario not only demonstrated a 50% increase in the probability of observing Pileated Woodpeckers but also documented a range expansion in the southeast and southwest regions of the province (Cadman et al. 2007). Breeding distribution of the Pileated Woodpecker in Minnesota based on the Breeding Bird Atlas (2009 – 2013). Summary statistics of observations by breeding status category for the Pileated Woodpecker in Minnesota based on all blocks (each 5 km x 5 km) surveyed during the Breeding Bird Atlas (2009-2013). Summary statistics for the Pileated Woodpecker observations by breeding status category for all blocks and priority blocks (each 5 km x 5 km) surveyed during the Minnesota Breeding Bird Atlas (2009-2013). Predicted breeding distribution (birds detected per 10-minute point count) of the Pileated Woodpecker in Minnesota based on habitat, landscape context, and climate data gathered during the Minnesota Breeding Bird Atlas (2009-2013) using the General Linear Modeling method without an adjustment for detectability. In the Upper Midwest, the Pileated Woodpecker is considered an inhabitant of extensive, mature hardwood forests but can also be found in coniferous and mixed coniferous-deciduous stands (Green 1995). Both upland and lowland forests are used, but in the eastern United States and Canada, the woodpecker often demonstrates a preference for floodplain forests that provide large trees, a greater density of stems, and a higher crown canopy (Figure 5). If large trees are left standing on harvested sites, young regenerating forests also may harbor nesting birds (Bull and Jackson 2011). In Minnesota, habitats within 200 m of MNBBA point counts where Pileated Woodpeckers were detected were dominated by upland coniferous forests followed by forested wetlands (bogs), and northern mixed forests (Figure 6). A wide diversity of other habitats also were found including oak forests, pine forests, lowland coniferous forests, and northern hardwoods. Although some consider the bird to be an area-sensitive species, as Pileated Woodpeckers have expanded their range into urban, suburban, and agricultural areas, they are utilizing smaller woodlots, city parks, and very narrow stream corridors. Figures 7 and 8 illustrate the wide range of landscapes where Pileated Woodpeckers were found in Minnesota during the MNBBA. Figure 7 shows a block in central Cook County in a completely forested landscape; Figure 8 shows a block in west-central Clay County in an agricultural landscape interrupted only by a very narrow riparian corridor along the Buffalo River in the northeastern corner of the block. Pileated Woodpeckers were confirmed nesting in both blocks. Biologists correctly caution that when species are found in small, isolated patches of suitable habitat, their mere presence does not indicate they are successfully sustaining local populations. These small fragments may instead serve as “sinks” because the birds are attracted to the habitat but fail to find sufficient resources to successfully reproduce. The MNBBA, however, documented at least 4 confirmed nesting reports from the state’s intensively cultivated western landscape, and all were along narrow riparian corridors. Even these small ribbons of habitat, which appear very small from a landscape perspective, can provide suitable breeding habitat for this woodland species. The species’ preference for riparian forests was documented in the northern forested landscapes of Minnesota and Wisconsin, where a long-term monitoring program on four national forests has been under way since 1991 (Niemi et al. 2016). Although the birds were found across a wide range of different upland and lowland habitats, they were most strongly associated with riparian forest stands. Typical breeding habitat of the Pileated Woodpecker in Minnesota (© Lee A. Pfannmuller). Habitat profile for the Pileated Woodpecker based on habitats within 200 m of point counts where the species was present during the Minnesota Breeding Bird Atlas (2009-2013). Minnesota Breeding Bird Atlas block T62R3a in Cook County. 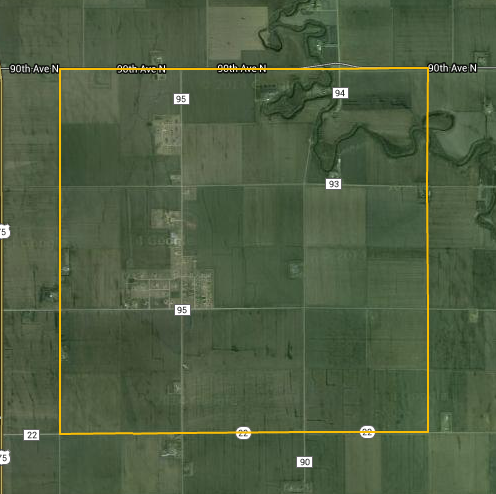 Minnesota Breeding Bird Atlas block T140R48a in Clay County. Data collected by the federal Breeding Bird Survey (BBS) generated a 2016 continental population estimate for Pileated Woodpeckers of 2.6 million birds (Rosenberg et al. 2016). In 2013, Minnesota was estimated to support 2.10% of the North American population (Partners in Flight Science Committee 2013). Applying that percentage to the most recent population estimate generates a statewide population of approximately 54,000 breeding adults. Although the Pileated Woodpecker is more abundant in the southeastern United States, it does not reach high breeding densities anywhere within its breeding range (Figure 1). In Minnesota, an average of less than 1 bird is observed each year on BBS routes in the state. Even in states with relatively high breeding densities, such as Arkansas, Louisiana, and South Carolina, an average of only 2 to 3 birds are observed per route (Sauer et al. 2017). Estimates of local breeding densities vary widely; several studies in the southeastern United States have reported densities ranging from a low of 0.11 pair per 40 ha to a high of 3 pairs per 40 ha (Bull and Jackson 2011). On Minnesota’s two national forests, observers detected an average of 4.4 Pileated Woodpeckers per 100 unlimited radius, 10 minute point counts on the Chippewa National Forest, and 7.6 on the Superior. This compares to an average of 26.1 Yellow-bellied Sapsuckers on the Chippewa and 22.2 sapsuckers on the Superior, the most common woodpecker on both national forests (Niemi et al. 2016). Overall, the Pileated Woodpecker population has been steadily increasing since the BBS began in 1966. Because of its relatively low abundance, many of the state and regional population trend lines lack statistical precision. 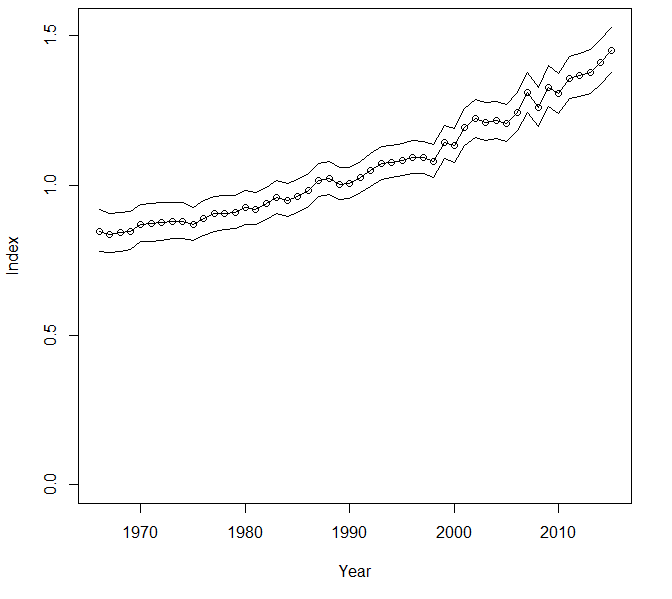 The exception is the trend line for just the United States, which demonstrated a significant annual increase of 1.11% per year since 1966; the rate of increase has been even higher since 2005 (1.87% per year; Figure 9). The trend line in Minnesota lacks precision but also suggests a significant annual increase at a rate that is nearly double that observed across the entire United States (Sauer et al. 2017). The species also has shown a statistically significant increase on the Chippewa National Forest from 1995 to 2016; farther east, its trend on the Superior National Forest has been relatively stable but suggests a small increase. When data for the two forests are combined, they also show a significant regional increase (Figure 10). The regional trend observed in northern Minnesota is replicated throughout the species’ breeding range. The only region that has a significant decline is the West Gulf Coastal Plain/Ouachitas region, which spans portions of southeastern Oklahoma, southern Arkansas, northern Louisiana, and eastern Texas (Sauer et al. 2017). Overall, biologists have estimated that the Pileated Woodpecker’s North American population has increased 87% since 1970 (Rosenberg et al. 2016). Population increases documented since the latter half of the 20th century may be attributed in part to the spread of Dutch elm disease. The dead trees are a rich source of carpenter ants, wood borers, and other wood-inhabiting invertebrates. Nicholls (1994) found that one particular wood borer species present in dead elms, the round-headed cerambycid wood borer, was a specific target of Pileated Woodpeckers. Forest management practices that emphasize retention of large trees, including snags, in riparian areas may be another important factor contributing to the species’ increase, as is the continued maturation of second-growth forests in the northeastern United States (Bull and Jackson 2011). Breeding population trend for the Pileated Woodpecker in North America from 1966–2015 based on the federal Breeding Bird Survey (Sauer et al. 2017). 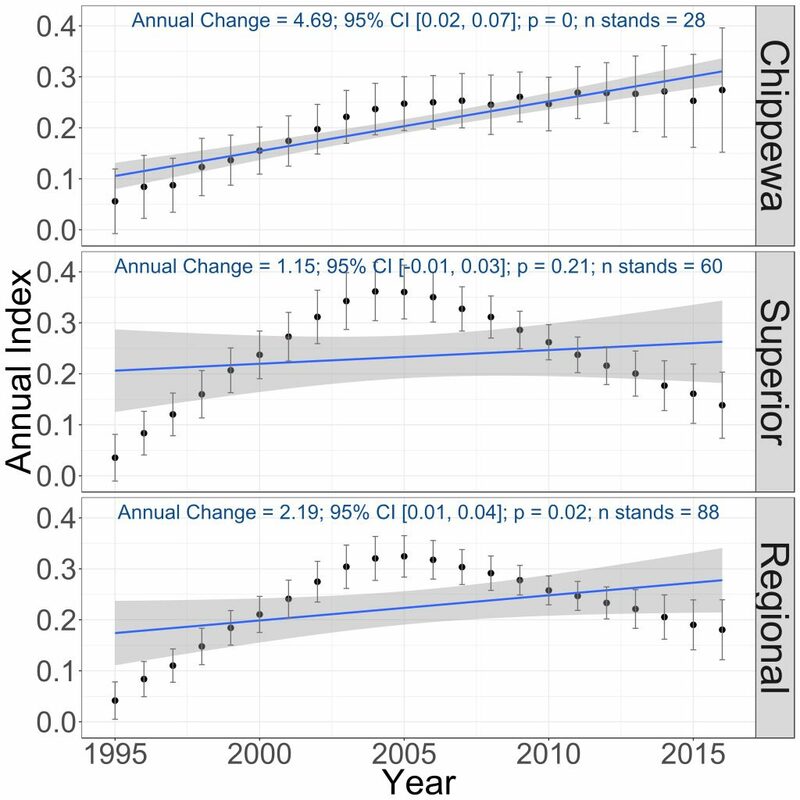 Breeding population trends of the Pileated Woodpecker in the Chippewa and Superior National Forests and the combined regional trend, 1995–2016 (Bednar et al. 2016). With a large and steadily increasing population, the Pileated Woodpecker has not been the focus of any concerted conservation efforts at either the state or federal level. It has been assigned a relatively low Continental Concern Score of 7/20 (Rosenberg et al. 2016). The most significant threats to the species are the loss of forested habitat and “clean” forest management practices that do not retain large snags or live trees, which provide essential foraging, roosting, and nesting habitat. Persecuted for many years in the late 1800s and early 1900s, the Pileated Woodpecker is now considered a critical member of a healthy forest ecosystem. The nesting and roosting cavities it excavates provide shelter for a host of other birds and small mammals that use secondary cavities. As they chisel away at live and dead trees in search of tasty morsels, their work also accelerates the rate of forest decomposition and nutrient recycling and attracts other birds that feed on the exposed invertebrates (Bull and Jackson 2011). The Pileated Woodpecker has shown a high degree of adaptability in utilizing a wide range of woodland habitats, a trait that has certainly aided its population recovery. Other than the loss and degradation of habitat at the local scale, the species faces few significant threats. Even warming climates may be of little concern to this giant of the eastern forest landscape. A cursory review in 2010 ranked its vulnerability to climate change as low (North American Bird Conservation Initiative 2010). In the near term, as long as sufficiently large trees and snags are available to provide feeding, roosting, and nesting opportunities, the species will continue to remain a common member of the state’s avifauna. Nicholls, Thomas H. 1994. “Pileated Woodpecker Use of Elm Trees Killed by Dutch Elm Disease in Northern Wisconsin.” Passenger Pigeon 56: 21–28.